Hello everyone! 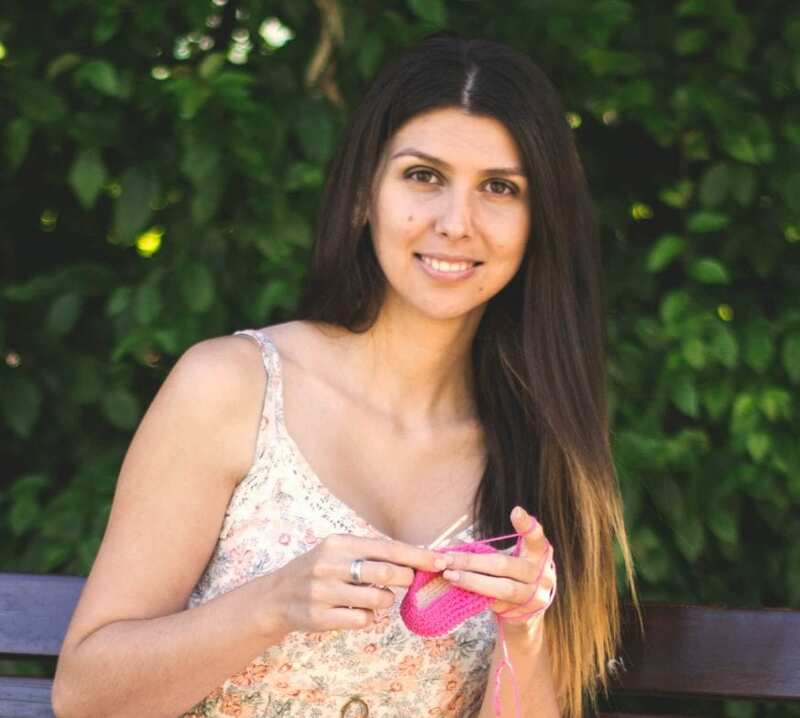 I’m so excited to share with you my latest crochet pattern. 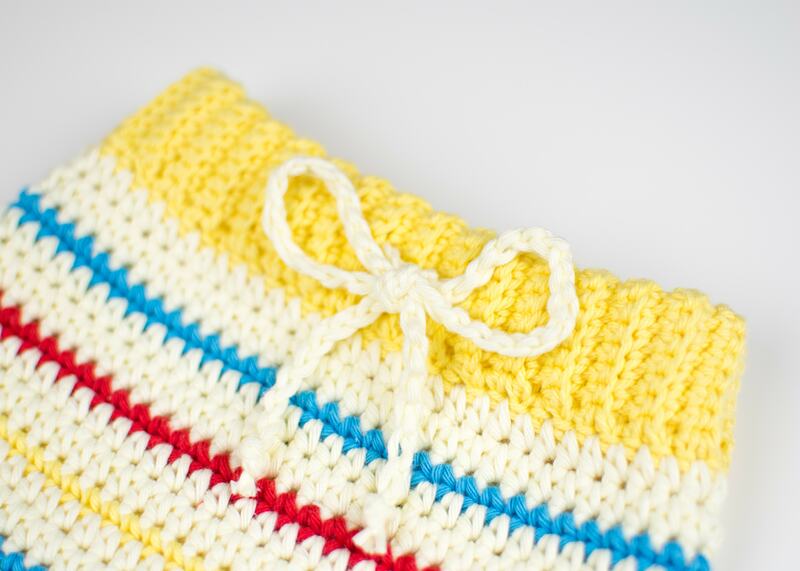 It’s for adorable crochet baby pants with yellow, blue and red stripes. The pattern was super fun to make and the pants came out adorable. The biggest challenge was the ribbing around the waist area. What makes it so special is that the ribbing is actually adjustable. Yes! It’s made as a tube joined together in a circle or ring. 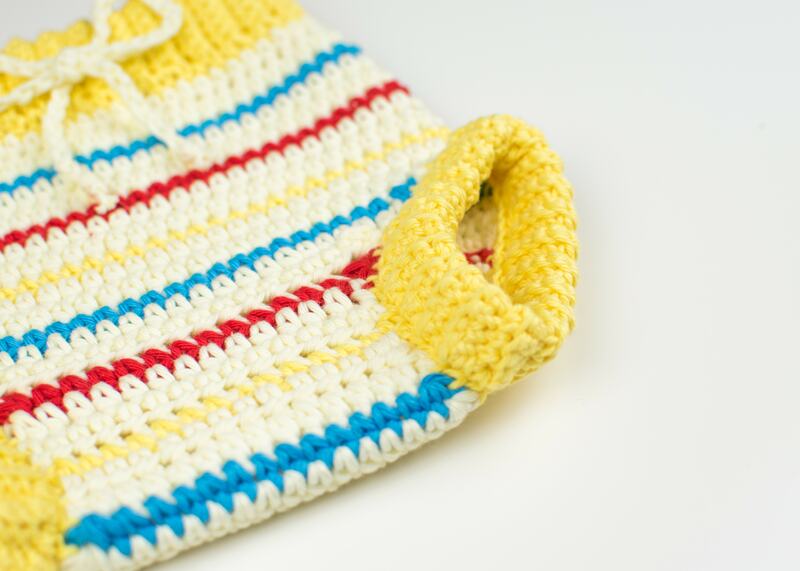 It has two tiny holes on the side, so we can insert the chain, twisted cord or a ribbon. YARN: I was using two yarn weights; DK weight for the ribbings and a small piece on the main part and Aran weight yarn for the most of the work done on the main area, and chain that goes around the waist. DK weight 100% cotton yarn (Paintbox Yarns Cotton DK (HERE!) – one skein of Daffodil Yellow (422)) and Aran weight 100% cotton yarn (Paintbox Yarns Cotton Aran (HERE!) 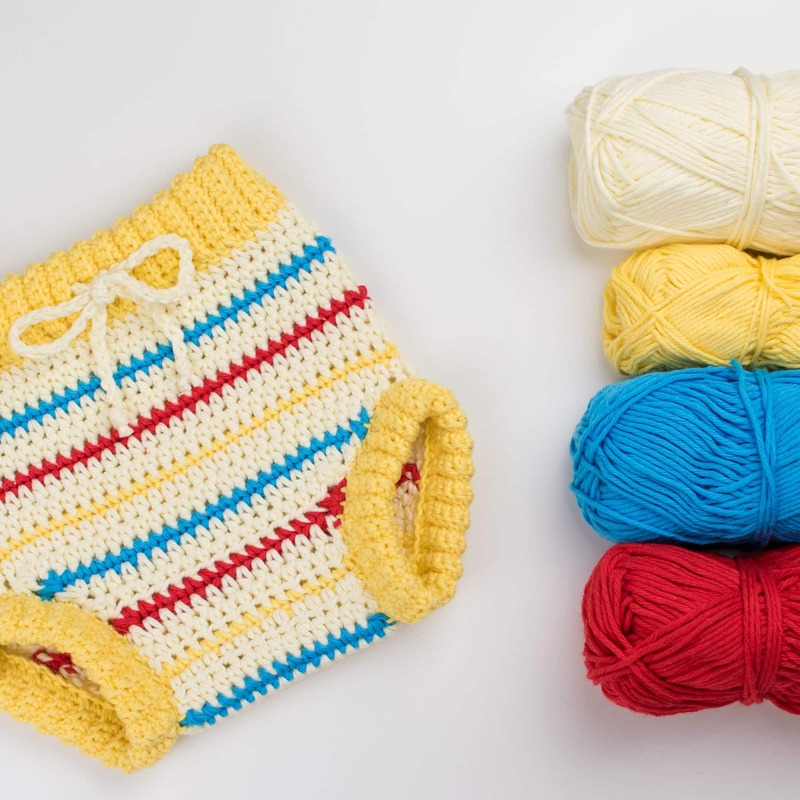 – one skein of each: Banana Cream (621), Sky Blue (639), Rose Red (614). YOU WILL ALSO NEED: a pair of scissors (HERE! ), stitch markers (HERE! ), a yarn needle (HERE! ), safety pin. GAUGE: 9 sts and 9 rows in DC measure 5 x 5 cm or 2 x 2 in. Measurements for 0 – 6 months: Waist (Circumference) 35 cm or 13.75 inches and length (from waist to bottom) 18 cm or 7 inches. 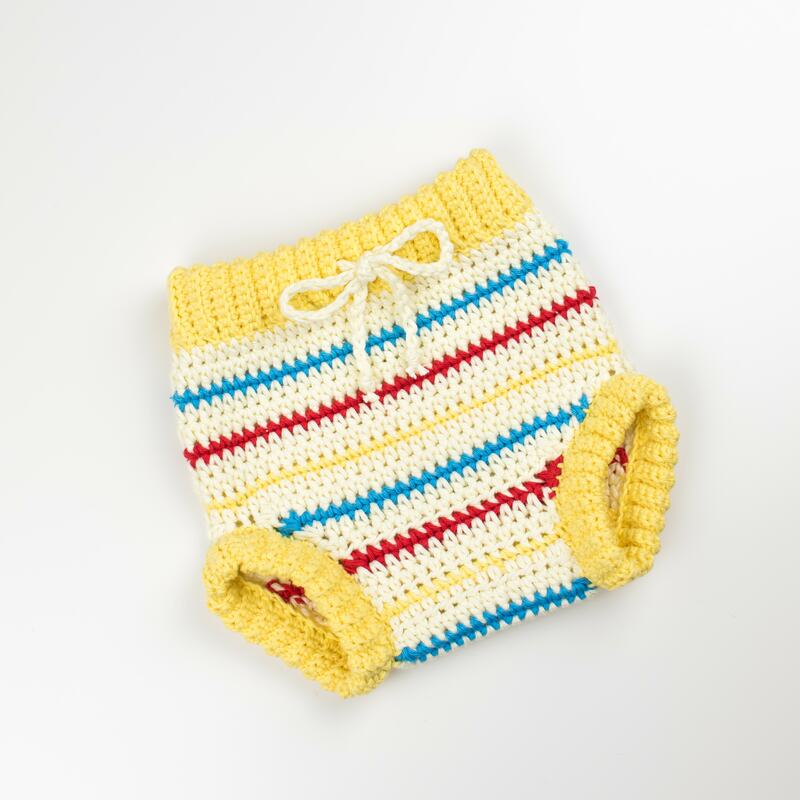 These baby pants are not the easiest crochet project that you could choose, but with the help of the video tutorial and written instructions here on my blog, you will learn all the steps and techniques you have to know to successfully complete the pattern. The instructions are divided into a few simple steps so you can understand it better and it’s not a big confusion of words and stitches. We will start with the ribbing around the waist area. From there on, we will continue and create a first place of the main part. Front and back part of the main area are made separately and later sewed. Then we will create two identical smaller ribbings and attach those tow around the leg hole. Almost done. Our last step is to make a long chain and insert it into the ribbing around the wast. We will start with the larger ribbing. 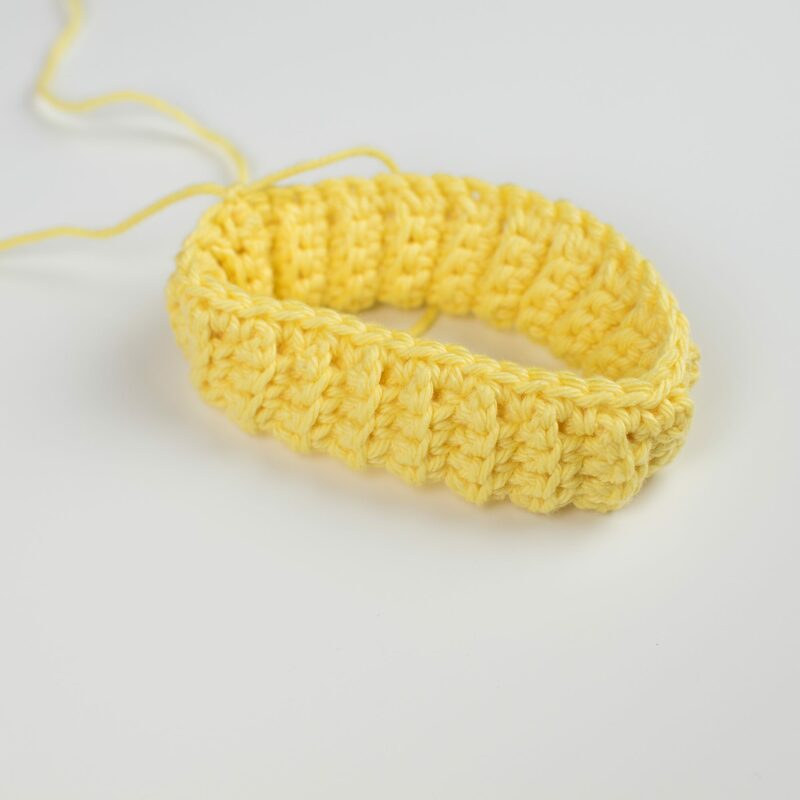 Take some yarn in a dark yellow color (I am using Daffodil Yellow (422)), 3.0 mm crochet hook and chain 15. Start in the 2nd ch from the hook and work in rows. Row 1: Work 1 sc into each of next 14 sts. Turn. = 14 sts. From now on work in BLO. Row 2 – 34: Ch 1. Work 1 sc into each of next 14 sts. Turn. = 14 sts. Row 35: Ch 1. Sc 3. Ch 1. Skip 1. Place a marker into the ch 1. Sc 10. Turn. = 14 sts. Row 36 – 38: Ch 1. Work 1 sc into each of next 14 sts. Turn. = 14 sts. Row 39: Ch 1. Sc 3. Ch 1. Skip 1. Place a marker into the ch 1. Sc 10. Turn. = 14sts. Row 40 – 66: Ch 1. Work 1 sc into each of next 14 sts. Turn. = 14 sts. Do not cut the yarn just yet. Join both ends of the ribbing together with a simple row of ss. Use one loop only! Do not cut the yarn. Now fold the ribbing in half, longwise. Align both ends of the ribbing and continue with the main part. 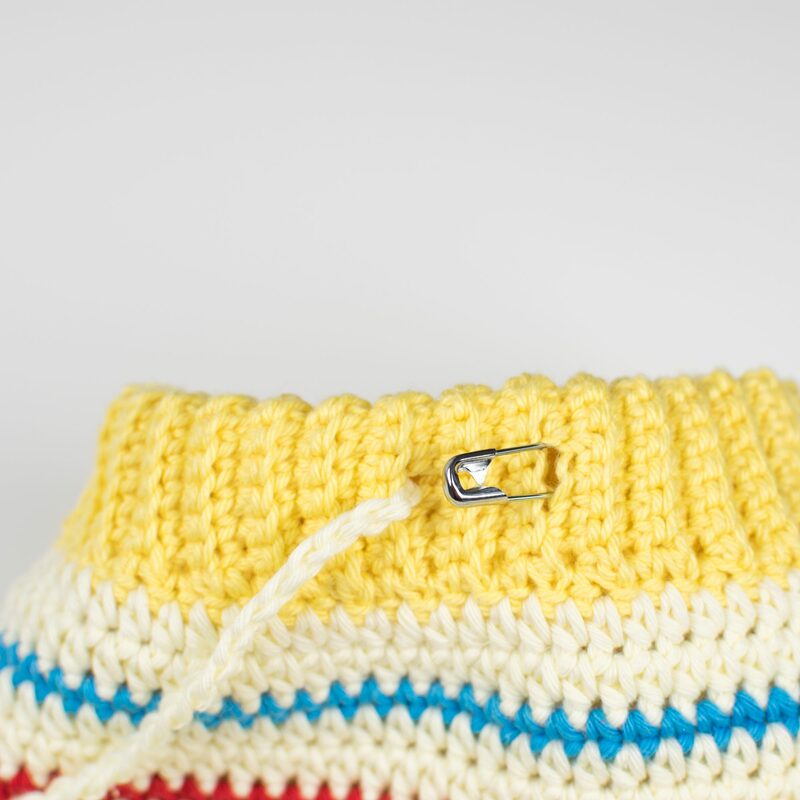 Make sure the stitch markers are on the outer side of the ribbing when the ribbing is folded in half. 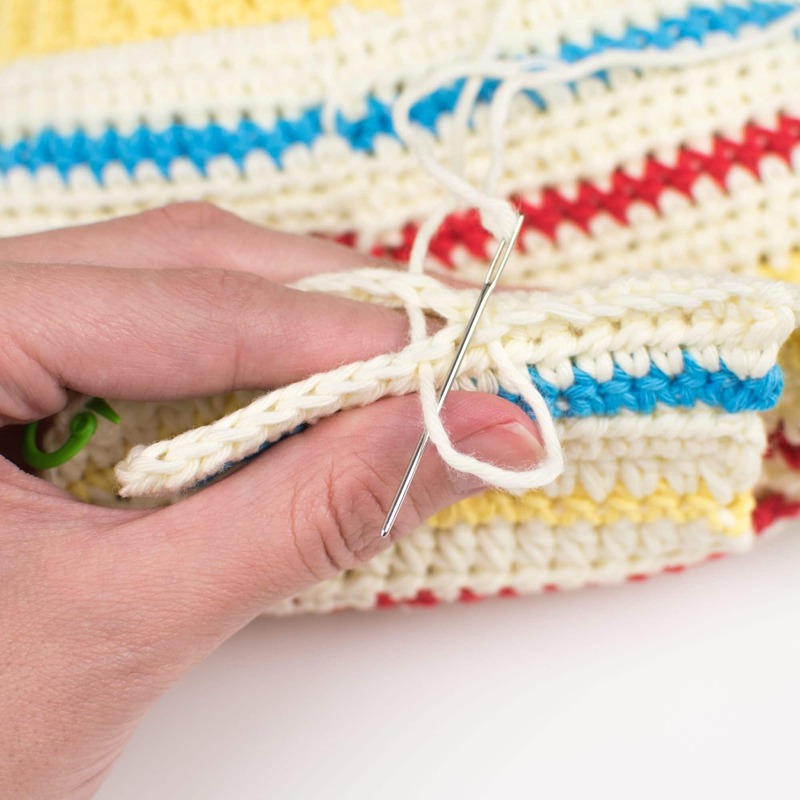 Don’t crochet stitch markers inside the ribbing. 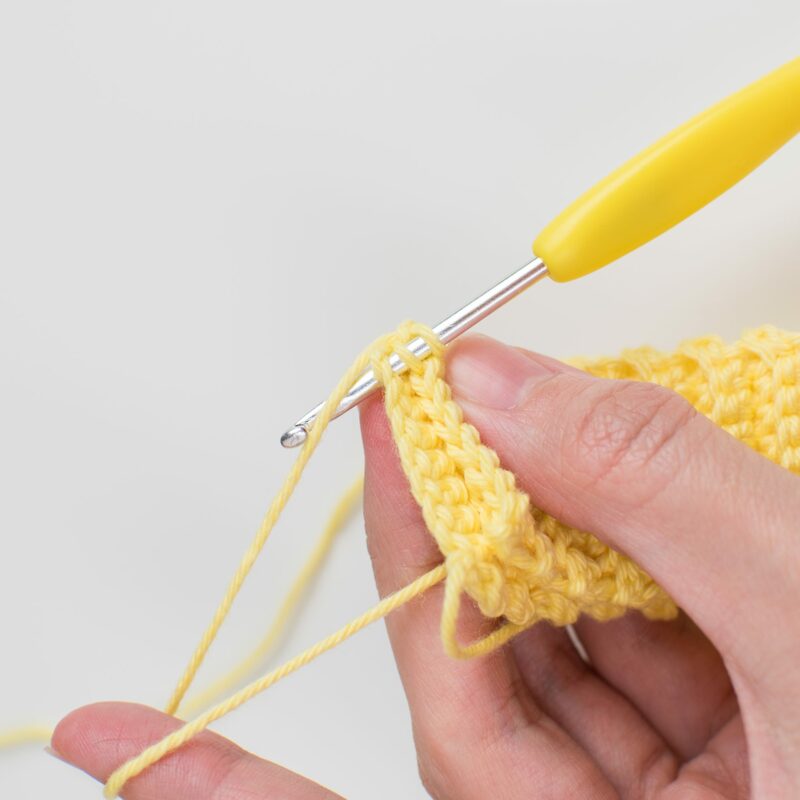 Change the size of the crochet hook from 3.0 mm to 4.0 mm crochet hook. From now you will be working in rounds. Changing colors will be used in the following order: YELLOW, light yellow, BLUE, light yellow RED, light yellow. Round 1: Continue with dark yellow yarn. Work 1 hdc into each st all the way around the ribbing. 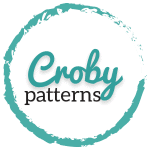 Make sure you are crocheting through both layers of the ribbing. Work 1 hdc into each of next 66 sts. Join the round with a ss made into the very first st of this round. = 66 sts. Round 2 -3: Use a light yellow. Ch 1. Work 1 hdc into each of next 66 sts. Join the round with a ss. = 66 sts. Round 4: Use a blue yarn. Ch 1. Work 1 sc into each of next 66 sts. Join the round with a ss. = 66 sts. Round 5 -6: Use a light yellow. Ch 1. Work 1 hdc into each of next 66 sts. Join the round with a ss. = 66 sts. Round 7: Use a red yarn. Ch 1. Work 1 sc into each of next 66 sts. Join the round with a ss. = 66 sts. Round 8 -9: Use a light yellow. Ch 1. Work 1 hdc into each of next 66 sts. Join the round with a ss. = 66 sts. Round 10: Use a dark yellow yarn. Ch 1. Work 1 sc into each of next 66 sts. Join the round with a ss. = 66 sts. Round 11: Change to light yellow. Ch 1. Work 1 sc into each of next 66 sts. Join the round with a ss. = 66 sts. Take 4 stitch markers and use two to mark 30 sts on the front (Front Part) and two stitch markers to mark 36 sts on the back (Back Part). From now on work in rows. I found out that the joining sts at the beginning of row made with dark yellow, blue or red yarn doesn’t look very nice and even when I turn the row. That’s why I will cut the yarn. I will move back to the beginning of the previous row and I will join the yarn again and start with stitch one. Row 1: Use the light yellow yarn. Place the item in front of you, you facing the front side. Insert the hook into the marked stitch on your left. Ch 1. Start in the same. Hdc3tog. Hdc 24. Hdc3tog. Fasten off, start in the first. = 26 sts. Row 2: Use the blue yarn. Ch 1. Start in the same. Sc3tog. Sc 20. Sc3tog. Cut the yarn and fasten off. = 22 sts. Row 3: Use the light yellow yarn. Ch 1. Hdc3tog. Hdc 16. Hdc3tog. You can turn the row, because the next row will be made with the same yarn. Do not cut the yarn. = 18 sts. Row 4: Use the light yellow yarn. Ch 1. Hdc2tog. Hdc 14. Hdc2tog. Cut the yarn and fasten off, start in the first. = 16 sts. Row 5: Use the red. Ch 1. Sc2tog. Sc 12. Sc2tog. Cut the yarn and fasten off, start in the first. = 14 sts. Continue working in rows. Turn after each row. Continue the same color pattern: two rows of light yellow, one row of dark yellow, two rows of light yellow, one row of blue, two rows of light yellow one row of red and so on. Row 6 -11: Ch 1. Start in the same. Work 1 hdc into each of next 14 sts. = 14 sts. Row 12: Ch 1. Work 2 hdc into the first one. Hdc 12. Work 2 hdc into the last one. = 16 sts. Work in rows. Use the same technique as in first few rows of the front part; cut the yarn and start the new row, but do not turn the row. Row 1: Use the light yellow yarn. Place the item in front of you, you facing the front side. Insert the hook into the marked stitch on your right. Ch 1. Start in the same. Hdc2tog. Hdc 32. Hdc2tog. Fasten off. = 34 sts. Row 2: Use the blue yarn. Ch 1. Start in the same. Sc2tog. Sc 30. Sc2tog. Cut the yarn and fasten off. = 32 sts. Row 3: Use the light yellow yarn. Ch 1. Hdc2tog. Hdc 28. Hdc2tog. You can turn the row, because the next row will be made with the same yarn. Do not cut the yarn. = 30 sts. Row 4: Use the light yellow yarn. Ch 1. Hdc2tog. Hdc 26. Hdc2tog. Cut the yarn and fasten off. = 28 sts. Row 5: Use the red yarn. Ch 1. Sc2tog. Sc 24. Sc2tog. Cut the yarn and fasten off. = 26 sts. Row 6: Use the light yellow yarn. Ch 1. Hdc2tog. Hdc 22. Hdc2tog. You can turn the row, because the next row will be made with the same yarn. Do not cut the yarn. = 24 sts. 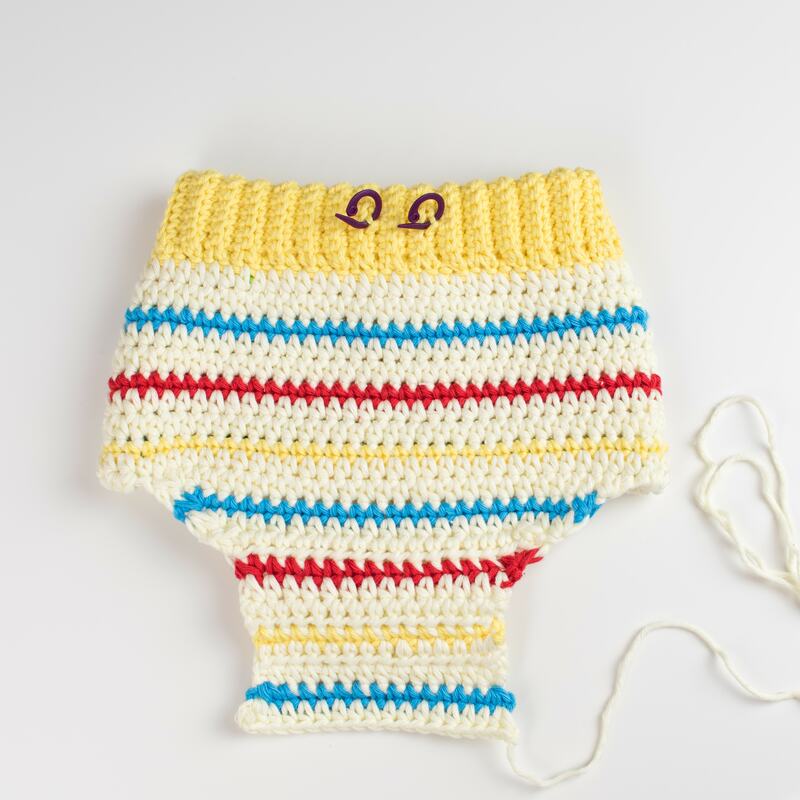 Row 7: Use the light yellow yarn. Ch 1. Hdc2tog. Hdc 20. Hdc2tog. Cut the yarn and fasten off. = 22 sts. Row 8: Use the dark yellow. Ch 1. Sc2tog. Sc 18. Sc2tog. Cut the yarn and fasten off. = 20 sts. Row 9: Use the light yellow yarn. Ch 1. Hdc2tog. Hdc 16. Hdc2tog. You can turn the row, because the next row will be made with the same yarn. Do not cut the yarn. = 18 sts. 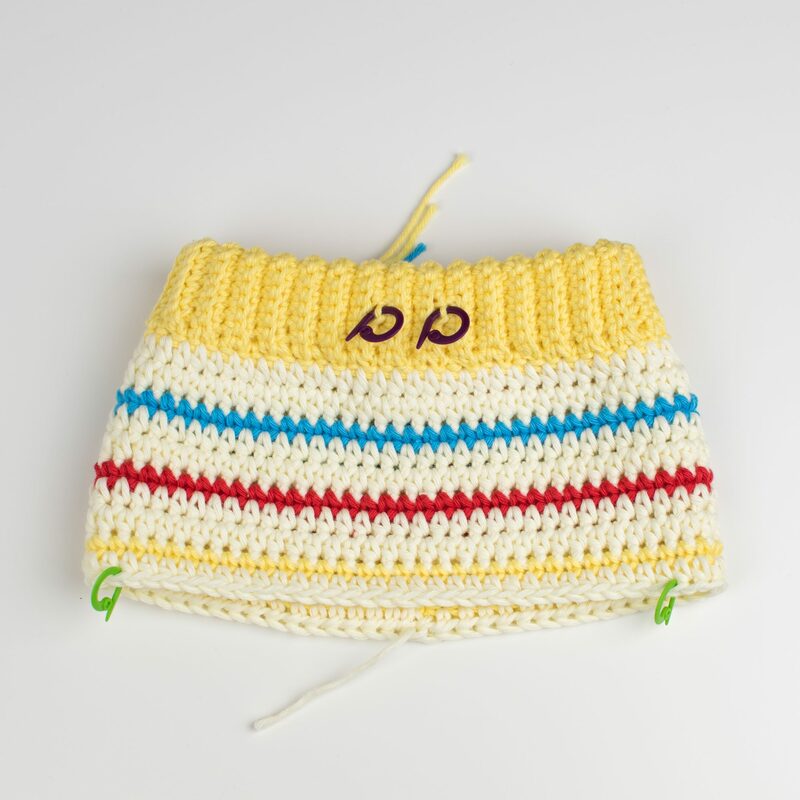 Row 10: Use the light yellow yarn. Ch 1. Hdc3tog. Hdc 12. Hdc3tog. Cut the yarn and fasten off. = 14 sts. Turn the pants wrong side out. Align all 14 sts on front and back part and sew them together using the yarn needle, yarn tail and your favorite sewing technique. Mine is a blanket stitch. Take a DK weight yarn and 3.0 mm crochet hook and create a foundation ch of 9. Start in the 2nd ch from the hook and work in rows. Row 1: Work 1 sc into each of next 8 sts. Turn. = 8 sts. Row 2 – 41: Ch 1. Work 1 sc into each of next 8 sts. Turn. = 8 sts. Do not cut the yarn just yet. Join both ends of the ribbing together with a simple row of ss (use FLO or BLO only). Fold the ribbing on half, longwise. Align both ends of the ribbing. The same as we sis on the ribbing around the waist area. Round 1: Work 1 sc into each st all the way around the around the ribbing. 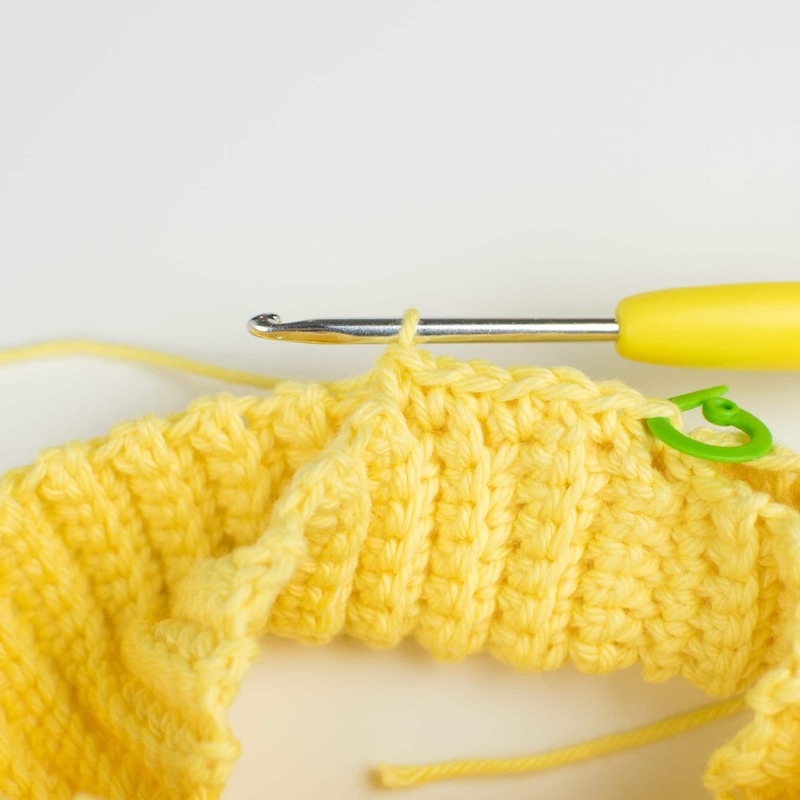 Make sure you are crocheting through both layers of the ribbing. Work 1sc into each of next 41 rows. Join the round with a ss. = 41 sts. You will need two for each leg one. Turn the pants wrong side out. Insert the ribbing into the leg hole; the round of sc sts has to be close to the leg hole edge. 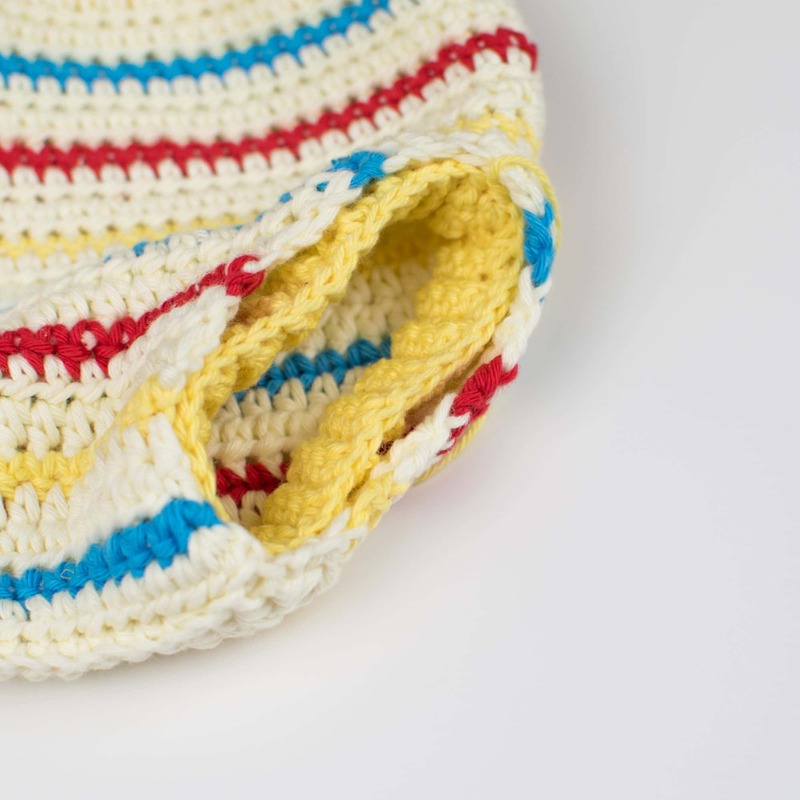 Sew the ribbing around the leghole using the yarn needle, yarn end and the blanket stitch. Repeat the steps for the second leg, turn the pants right side out and you are almost done. 1. Take a chain, attach the safety pin to one end. 2. Insert the chain into one of the holes in the ribbing. 3. 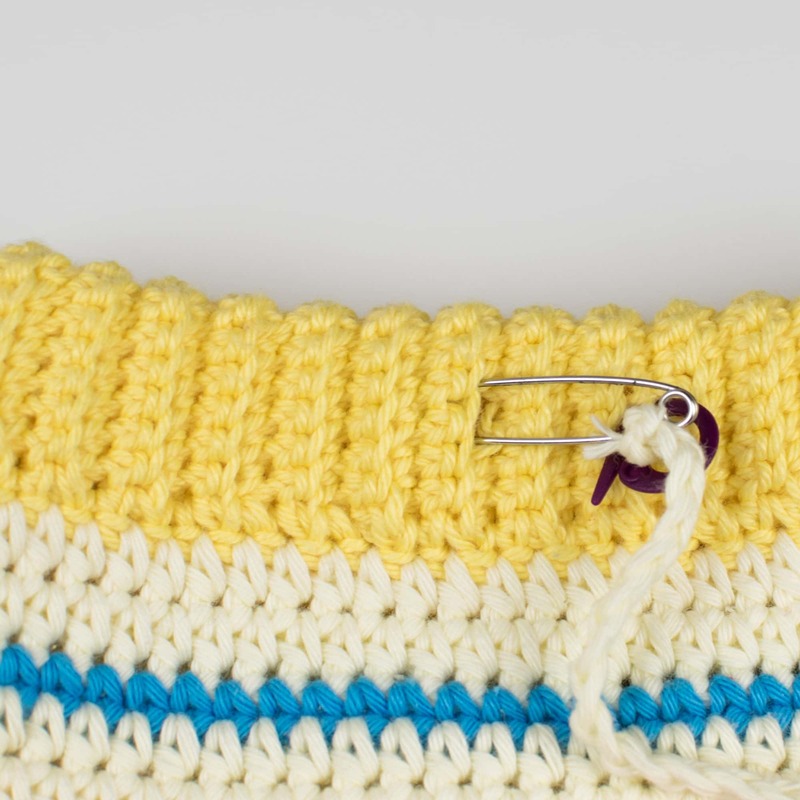 Pass the safety pin and chain all the way around until you reach the second hole on the ribbing. 4. Pull the safety pin and the chain through the hole. 5. Full both ends of the chain to get the even amount of chain/cord on both sides. 6. If the chain is too long, make a knot on the desired length and cut the rest of the chain.